In an interaction with some engineering college students some months ago, I asked my young friends what they thought was the relationship between human development and engineering sciences. The responses broadly defined development as ‘upgrading’ entities such as land, infrastructure, city spaces, markets, etc. For example, land development meant upgrading the utility of land. We stayed with that understanding and I posed my next question, “What factors affect upgrades the most?” After some discussion, the dialogue isolated two factors – knowledge and energy use. Knowledge of what? Of energy conversion. We felt that we had made a good beginning, so we decided to continue the dialogue. After I posed each question, the students provided various answers and there was heated discussion before we arrived at a consensus. Why is energy so very central for development? Because no physical, chemical, geological, and biological transformation is possible without energy expenditure. For example, plants grow using sunlight, transport happens using some form of energy – animate, fossil fuels, wind or water, continents and seas are shaped by geo-thermal energy, goods and services are produced expending energy. Now the discussion was getting interesting. 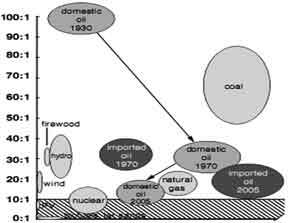 Historically, what were the energy sources that humans used? Humans have always been solar farmers, i.e., they used solar energy, either directly or indirectly to fulfill their needs. From the time the Cro-Magnon man made his appearance 50,000 years ago till the time agriculture was invented 10,000 years ago, humans have used their muscle power and biomass as energy sources. 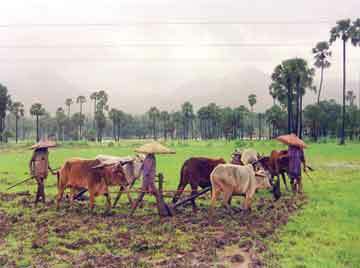 Domestic animals were used for the purposes of transport. Animate energy (human and animal energy) is a product of sunlight. Plants use it to convert atmospheric carbon dioxide (CO2) into biomass. Animals and humans are dependent either on plants or herbivores for their energy intake. Fossil fuels (coal, oil, gas) began to be used 500 years ago and have gradually replaced biomass and animate energy as the primary energy source to power human society. 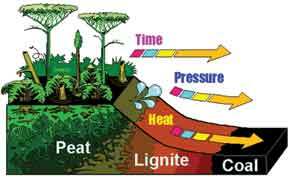 Fossil fuels are products of ancient sunlight as they were formed by the Earth exerting pressure and temperature on dead plants and animals from the Carboniferous period (300 million years ago). Today, we use 12,000 million tones of oil equivalent (toe is the energy in one tone of oil), 85% of which is from fossil fuels. Energy consumption has grown by leaps and bounds between when humans were primitives and now. Every major technological shift in human civilization has more than doubled per capita energy consumption. Per capita energy consumption grew slow till the industrial revolution, after which it exploded. A third of the energy consumed in the last two centuries was consumed in just the last two decades. Today, each of us consumes more than 100 times the energy that our ancestors did. In recent times we have overdrawn on the Earth’s capacity to deliver energy and natural resources and the Earth is groaning in its attempt to meet our demands. We now require 1.5 Earths in order to satiate our energy needs. We have dipped into the Earth’s natural capital rather than live off its interest. For example, rather than using only rainfall for agriculture, we use increasing amounts of groundwater, thus lowering groundwater levels each year. Rampant environmental degradation (pollution, freshwater depletion, etc) around the world and global warming are manifestations of this. At this point one student interjected, “But isn’t oil getting over?” True. This is called peak oil, i.e., global oil production is peaking around now as new oil finds have been few and far between in the last 3-4 decades, and gas will also peak in a couple of decades. Are there alternative energy sources? “What about coal?” Yes, the world has coal reserves to last another century or so. But if coal replaced current oil and gas consumption, global warming will occur even faster. For every toe yield from each fuel, CO2 emissions from burning coal is two times more than that from burning oil and two and half times that of burning gas2. What about other energy sources that can replace fossil fuels? There are only two noteworthy ones – green and nuclear energies. Unfortunately, neither of them is capable of replacing fossil fuels. Green energies have a 0.5-2.5 EROEI3, whereas fossil fuels have a 20-80 EROI. The significantly higher energy density of fossil fuels allows them to yield more energy for every unit of energy invested in harvesting them. Moreover, the environmental costs (cost of injury to human health, crops, forests, water bodies, etc) of fossil fuels are not considered, making them seem very cheap. As for nuclear power plants, there is only sufficient uranium ore to power the current nuclear reactors for 80 years more. Moreover, they have intractable safety and waste disposal problems. I then posed another question, “What is sustainable living?” The students made a serious attempt to define sustainable living and after a while the group veered around to the collective understanding that sustainable living meant that we must not overdraw on the Earth’s resources. This definition did not deal with overdrawl or how to measure it, but it posed another question, “Who is responsible for overdrawl?” Pat came the answer from several quarters. Increase in global population was responsible for overdrawl. And where is population growth happening? In developing countries. But is this argument supported by facts? Certainly not! 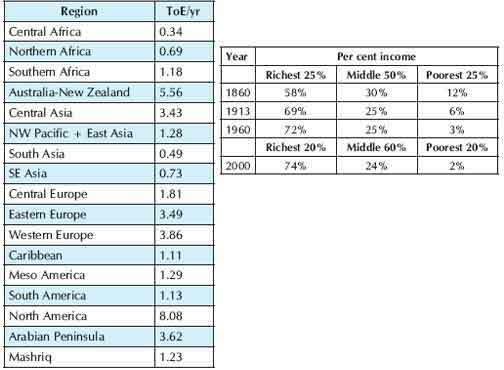 It is not population growth in developing countries that is responsible for overdrawl but the increase in consumption by the developed countries and the rich in different countries. 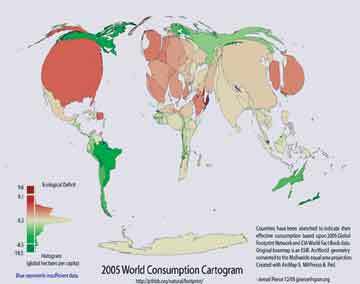 Per capita energy consumption and CO2 emission are good ways to measure human consumption. The average per capita annual energy consumption is a little over 1.7 toe/yr for the world as a whole, for North America it is 8.1 toe/yr, Western Europe 4 toe/yr, Central Africa 0.3 toe/yr, South America 1.1 toe/yr, South Asia 0.5 toe/yr, and India 0.4 toe/yr. Clearly, it is people in the developing countries that are consuming significantly more than those in the developing countries. Developed countries have been responsible for 78% of CO2 emissions since the beginning of the industrial revolution. 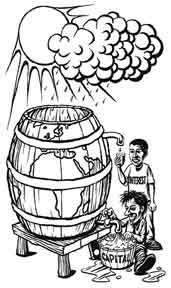 And the gap between the developed and developing nations and that between the rich and the poor is growing. Quite clearly, Daly’s prescription for sustainability is a step forward, but is inadequate as it does not address the cause for overdrawl, i.e., consumption of developed countries and the rich in all countries. At this stage, one bright young student put two and two together and asked a really fundamental question, “Isn’t sustainable development an oxymoron?” Why? Because development implies more energy use. But sustainability implies reducing our gross energy use as all indicators show that we have overdrawn energy and other natural resources. I agreed. The buzz-phrase, sustainable development, is an oxymoron. You cannot have sustainability and development, as understood today, at the same time. The definition makes two very important points. First, it talks about human needs and not wants. Needs are food, clothing, and housing and not luxury items. Second, it gives equal importance to meeting the needs of current and future generations. However, the definition fails to stress on the equity of entitlement to energy and other natural resources between people, i.e., it does not tackle the root cause of overdrawl. I suggested to my audience that to arrive at a reasonably satisfactory definition of sustainable living, we have to add to Daly and Brundtlands’ definition. They agreed. After much struggle, they did not get very far, so I decided to step in and offer my understanding. The sustenance needs of the present generation are without compromising the ability of future generations to meet their sustenance needs. The rate of use of renewable resources should not exceed their regeneration, the rate of use of non-renewable resources should not exceed the rate at which sustainable renewable substitutes are developed, and the rate pollution emission should not exceed the assimilative capacity of the environment. There is equity of entitlement to energy and other natural resources for all people, and to achieve that it is essential to treat all energy resources (energy sources, energy converters, energy conveyors and storage devices) as common property rather than as private property, except where the energy resource is purely for personal use to meet sustenance needs. These entitlements will have to take into account nature’s needs for these resources as nature is the maker and owner of these resources, not humans. This definition required a complete re-think in the way we relate to nature and to each other. To drive that point home, I told them the story of a survey we had conducted as engineering students in the Indian Institute of Technology, Mumbai in the early 1970s. The respondents comprised everyone from the senior faculty, including the Deputy Director of the institute, to the first year students. We asked them what differentiated technology from engineering. The junior students, as expected, could not come up with meaningful answers, but to our surprise, neither could the faculty. Engineering dealt with the science and art of applying energy to raw materials to obtain products and services. Engineering is a science and art that helps execute the upgrade necessary for human society to develop. Technology does the same thing but in a given social context. Engineering deals with the science that goes into the design and production of goods and services. Technology deals more with the applications that engineering science can be used for. For example, when we talk about today’s transport technologies, we refer to planes, trains, buses, horses, camels, and donkeys. No matter how unsophisticated the horses, camels and donkeys may be, they are still widely used and appropriate for the class of people and region where they are used for transporting people and goods. This survey told us something. Practitioners of a discipline often did not understand the role they played on a larger canvas. I now asked my young friends that if their engineering education had basically taught them to use energy to transform nature into goods and services, what good is this knowledge if there is going to be less energy in future? Had their college ever told them how to help the Earth recover its potential to deliver energy? My young friends were astounded and were at a loss for words for a full two minutes. The implications of my definition of sustainable living are far-reaching. It implies that human society must change its outlook from “Gain maximization for a few” – an outlook that has been predominant since the times of ancient slave societies 5,000 years ago – to “Risk minimization for all.” The latter is what all living creatures, except humans, do to live in harmony with nature. They take only as much energy and resources from nature as is required for their sustenance. Only humans take more than what is required for their sustenance as they possess what other living beings lack, i.e., the ability to create knowledge of energy conversion, and hence have been able to increase their energy drawls throughout history till today. Powering down global energy to about 40% of the current energy consumption of 12,000 million toe/year and in future relying primarily on the sun, the only reliable long-term energy source we can tap safely. Powering down implies getting rid of extravaganzas like space exploration programmes, standing armies (they consume ~10% of global energy consumption currently) and national borders. For the sake of argument, if we were to power down our energy use to 5,000 million toe/year and distribute it equally amongst the world’s 7 billion people, each of us would get ~0.7 toe (current global average is 1.7 toe/year), or about the same as the average per capita energy consumption prevalent during the 17th century. Is a decent living possible with this energy consumption? Yes, because modern technology is more efficient than before. A family of four can afford to live in a decent-sized home with a fridge, an oven, a music system, mobile phones for all and eat well, but cannot afford to have air conditioners and private vehicles. At 0.7 toe/year, an Indian can double her energy consumption over current average levels. But for that to happen, the Americans must reduce their consumption by 90% and Europeans by 80%. That is a real challenge. How do we convince the Americans and the Europeans (and the rich in all countries) that if human society is to survive and live in peace, they need to change their way of life and reduce their energy consumption? This is what today’s youth will have to think about. We will also have to have a universal risk standard for all risks – natural and man made – for all humans, which must be fixed and implemented. This implies that some areas that have higher risks, for example, cyclone prone areas, will require higher investments to reduce risk to the residents there. We should not wait for that perfect society to come into existence at some point in future to start implementing community level programmes that can move us towards sustainable living. Wherever possible, we need to reduce energy and material use and move towards energy equity. People in different parts of the world have started in small ways on this journey. Some have discarded private transport, others have started living in collectives, do organic farming, grow community forests, and yet others are using solar cookers and have installed photo voltaic panels on their roofs to power their homes. Such efforts are essentially individual initiatives and cannot solve the social problems of energy overdrawl and energy inequity. But such initiatives, in a practical way, challenge the ideology of “Gain maximization for all”, which engenders unsustainable living. More than a thousand words, it is such actions that will help us re-configure our relationship with nature and with one another to usher a sustainable and equitable society. CO2 emissions for 1 toe energy yield from different fuels in India: coal-6.7 T CO2, oil-3.4 T CO2, gas-2.5 T CO2. EROEI is Energy released for energy invested. An EROEI of 20 indicates that one unit of energy is required to explore, mine, refine and deliver 20 units of energy. A negative EROEI, as is the case with some bio-fuels, means that more energy has to go into making and delivering them that the energy they will yield. A low EROEI makes the energy source unattractive. The author belongs to the most rapacious predator tribe that ever stalked the earth – humans, and to a net destructive discipline – engineering, that has to take more than a fair share of the responsibility for bringing earth and human society to tipping points. If you still want to write to him, his email is sagdhara@gmail.com.